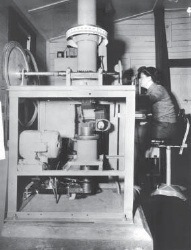 In December 1940 the Public Works Department began the construction of a Radio Detecting and Ranging installation. This and later units are referred to here by the American term ‘Radar’, though at the time the operating personnel referred to it as the ‘Hush Hush", a reference to the stringent security surrounding the system. In December 1942 the first group of the WAAC’s (Women’s Auxiliary Army Corp) arrived at Godley Head after training in Radar operation at Fort Dorset near Wellington. They steadily took over as the Batterys’ radar operators until eventually they were responsible for whole Radar operation. The WAAC’s operating the Radar were among the last personnel to leave Godley Head at the end of the War. The first unit a Coast Watching Set (CWS) Mk1 was located in a building called Station S4, immediately adjacent to BOP1 and had its own generator. Its mast, aerial and gearbox were attached to the rear of the BOP1. The Post and Telegraph Department installed the system and it was operational by 1800hrs on the 4th of January 1941. How it failed to identify the German raider Adjutant as she laid a pattern of ten magnetic mines close off Lyttelton Heads on the night of June the 24th 1941 is unknown. A crew of 8 to 12 Gunners were trained in the CWS Mk1 systems’ operation by Wellington based personnel from the Department of Scientific and Industrial Research. The CWS unit acted primarily in an Electronic Warfare (ES) role but occasionally performed as a Gunnery Set (GS). The CWS unit at BOP1 was replaced with an improved NZ 105 system which had a reach of up to 65,000 yards. The horizon from BOP1 is 68,000 yards. While the CWS was being replaced, the Super High Definition (SHD) unit at Station S1 acted as both an EW and GS. In August 1943 the new Coastal Defence (CD) No.1 Mark V equipment was placed in operation at the S4 site. The cabin and power units were mobile and able to be moved up alongside the existing building. Once the Mark V was giving good results instructions were received to dismantle the NZ 105 and return it to stores. At this time the Mark V unit was designated to take over the role as EW set to the Examination Battery at Battery Point. On 29th October 1943 the S4 site was abandoned and the Mark V set moved to alongside the Port War Signal Station. On the 2nd of November 1943 the 80 Battery at Godley Head was placed into “Care and Maintenance”. 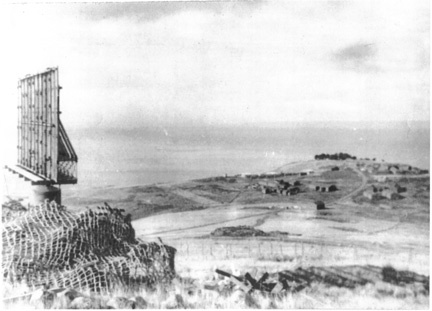 The second Radar installation, Station S1, was immediately behind the two gun positions of the Godley Head Battery. It was commenced on the 4th of August 1942 and became operational on the 26th of October of that year. The set was a CA No.1 Mk1 SHD unit, which acted primarily in the GS role. In late 1942, the Mark 1 at Station S1 took over the CWS role from Station S4, while that station was being upgraded to an NZ 105 set. When the Godley Battery went to “care and maintenance” in 1943, Station S1 was also “moth-balled”. Work commenced on the 15th of May 1945 to dismantle the SHD equipment and dispatch it to Burnham Stores. The work was completed by the 17th of May 1945. Later on, during the Compulsory Military Training period, an Observation Position was erected on top of this radar building. 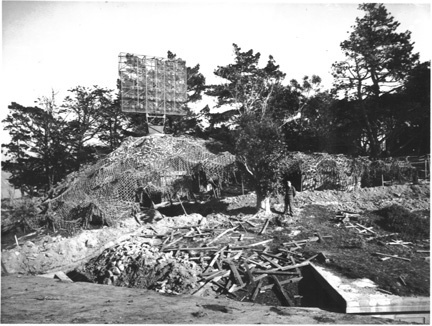 The third radar installation was of a more temporary nature and located near to the second position of the Port War Signal Station (PWSS). It housed the CD No.1 Mk.5 from Station S4. Installation began on the 29th of October 1943 and 1943 and it became operational the next day in a cabin structure. On the night of the 9th of January 1944 a howling nor’ west wind overturned the cabin and the three WAAC’s on duty had to extricate themselves and make their way to the PWSS for help. Later that year the original building from Station S4 was dismantled and moved down to the PWSS site where the radar equipment was installed and in action on the 18th of August 1944. In October 1944 the system was upgraded to the Star model of the Mk.V where it acted primarily in a coast watching capacity. In August 1945 the set ceased its military operational role but continued to be partially manned by four operators for the purpose of assisting the Inter-Island steamer entering the Port of Lyttelton.